Judy’s childhood home in Lancaster, CA is in danger of being torn down. The owners want to turn it into a museum, but have experienced roadblocks. Here is the information. Please help however you can. This is the last residence of Judy’s prior to moving to Los Angeles and becoming a star. Judy’s father ran the local movie theater, and residents still remember Judy and her sisters playing and going to school. Hi! 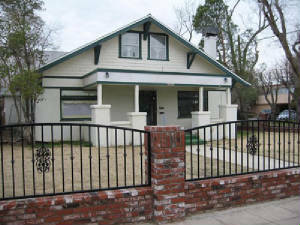 I visited 1207 Cedar Ave. in April 2007 and took many pictures. It was a group home at the time. The owner could not be there to give me a tour and was kind to allow one of the residents to let me in and photograph. They even had a shelf for Judy Garland memorabilia in the living room. There was a beautiful hutch built into the dining room wall that was original as well as the doors and natural wood floor. Also the windows looked like they had the original oak trim. Just to the left coming in what looked like a beautiful original front door was an oak double door if I recall correctly to some side room. I could only be in the living and dining room area as many were living in the home. There had been a fire just a few years before that was mainly on the second floor, so at least the first floor was saved. A lady in the neighborhood had said 1207 had been on the Historic Register and after the fire the plaque was taken down, which she felt was wrong. Also looking outside of the home all looked very sound and original and very nicely taken care of and painted. I think the dry desert climate really keeps many homes there in good repair as many homes in Judy’s part of town were from the 1920’s housing boom and looked very nice. In the back yard there was a small dwelling that had bedrooms for more of the residents, and a small back yard area for them with a tall privacy fence. I walked down the street the very same way the Gumm sisters walked to go to the school just a few blocks away. The beautiful original school is still there only it has turned into what seemed offices and a lay down lot for either Antelope County or the city of Lancaster street construction equipment. All the original school seemed intact. Sadly though the grounds are surrounded by tall chain link fence topped with that horrible razor wire. Also the school looked of nice design with tall columns to what looked like a breeze way kind of area too, maybe part of taking advantage of cool desert breezes. Just walking down the street and saying hello I met a very nice lady, her name is in my diary… who was home care attendant for I think it was a Mrs. Sells, or a name like that. Mrs. Sells lived until almost 100 yrs old and had transcended only about 3 years before I arrived. She had excellent recall. This lady said Mrs. Sells remembered the three sisters coming to their house and singing Happy Birthday to her. She was friends with Frank and Ethel, the whole family. Mrs. Sells even willed her home to the nice lady who took care of her and her family. I forgot her name too. She had a scrap book of some old photos and news articles, yet now 9 years later I can’t remember all of the content of it. I went to the Lancaster Public Library where they had special files for famous people of the town. Sadly the librarian said a few years before someone had stolen all the Judy Garland items from the file. I walked all around the area of Judy’s house. I even met a very nice man who had been personal attendant to Mae West until she transcended. He keeps a large collection of her wardrobe. He led me on to the local museum, yet the contact person there was very busy with some big event that was going to happen and didn’t have time to open the old hotel where Judy and family stayed that was close by. Even the sidewalks, parts of it, looked very old yet in good condition and imagined Judy and family all having walked down it. The theater Frank managed, where it once was, was only about 3 blocks away on the main drag. I also indirectly met the son of the funeral director, his parents… who knew the Gumms. I could only speak to the son of the original owner of the funeral home only about 3 blocks from the Gumm’s old house. I forgot his name… also in my diary. Unfortunately I could only speak to him through their tiny speaker connected to their office bell. He was carrying on the family funeral home business, a very small funeral home. He was very nice but getting ready to counsel a family and plan a funeral for their loved one and also another funeral to prepare for, so it was a bad time for him. He did say that Frank and Ethel also sang at funerals. They sang at his grandfather’s and I think also his grandmother’s funerals. On my next trip to Lancaster I’ll make it there. He had a lot more to say but apologized. I fully understood and admired his commitment to attend to those he cared for. I walked by the old, very old, hotel where the Gumm’s stayed when they very first arrived at Lancaster. On a back side walk or steps the Gumm sister’s had left their names and hand prints I was really hoping to see. The timing wasn’t right and the hotel was closed. I forgot what other business is in there now that was only open about 3 days a week. It is very special to be where such talent and inspiration to the music world and cinema once lived. It carries echoes of Grand Rapids Minnesota and the house and museum there too, another great place. Try to go there during the annual Judy Garland Festival if you can. I played piano for six festivals so far. I use to play on and off for tourists too. There is even the old school Judy’s sisters attended there, Central School, on the Historic Register and very well preserved too.